He’s been gone from office for three years now but the legacy of Troy Hebert lives on at the Louisiana Office of Alcohol and Tobacco Control (ATC). Hebert recently prevailed in a federal lawsuit filed for fired ATC agent Brette Tingle and that decision is currently being appealed. But another suit by fired agent Randall Kling, tried in state court resulted in a jury award of nearly $400,000, plus legal interest from May 26, 2011, the date Kling filed his suit in 19th Judicial District Court in Baton Rouge. That decision, which somehow flew under the radar of all Baton Rouge news media, including LouisianaVoice, was rendered just over a year ago, on December 30, 2017 and like the Tingle decision, is currently under appeal. Baton Rouge attorney J. Arthur Smith represented both Tingle and Kling in their litigation. In that action, Kling had claimed that when he made official complaints of what he deemed was offensive behavior on the part of Hebert on March 16, 22, and 25 in 2011, Hebert fired him on March 30. The breakdown of the award was $243,045 in lost wages, $75,000 for mental anguish and distress and another $75,000 for loss of enjoyment of life. Nineteenth JDC Judge William Morvant, in writing the formal judgment, somehow managed to circumvent the usual 6 percent per annum interest the state pays on judgments and set total interest at $9,538.06. At 6 percent, interest would normally accrue at a rate of about $24,000 for each year since the suit was filed in May 2011 until final resolution, which is still pending. If applied as in other judgments against the state, that would mean Kling would be entitled to more than $168,000 to date. In any case, it will be the taxpayers of the State of Louisiana, and not Hebert, who will be called on to pay the judgment should the verdict be upheld by the First Circuit Court of Appeal and, should it advance that far, the Louisiana Supreme Court. And that $400,000 doesn’t even include the cost of the state’s having to pay a contract attorney to defend Hebert and the Department of Revenue, costs paid through the Louisiana Office of Risk Management. It’s another example of state officials, in this case, Troy Hebert, not being held personally accountable for their actions and taxpayers having to pick up the tab for their bad behavior. Morvant, by the way, is the same judge who only yesterday (January 10, 2019) declined to hold Attorney General Jeff Landry personally liable for refusing to allow an Indiana woman access to what were clearly public records. Unless some real teeth are put into these judgments, Louisiana’s public officials will go on disregarding the law in the knowledge they will suffer no personal consequences. But now, three years after his hard-fought battle to clear his name, events are only now coming to light that illustrate just how far the Jindal administration was willing to go in violating Painter’s Fourth Amendment rights against unlawful search and seizure in order to build what it thought would be a slam dunk criminal case against him. Instead, the state ended up having to pay Painter’s legal fees of $474,000. Documents obtained by LouisianaVoice also show that investigators lied—or at least distorted the truth beyond recognition—about Painter and that the state tampered with and/or destroyed crucial evidence, much of it advantageous to Painter’s case. Benson, after all, was a huge contributor to Jindal campaigns and the state’s agreeing to lease office space from Benson Towers at highly inflated rates apparently was not enough for the owner of the Saints; that liquor permit needed to be approved, rules notwithstanding, and when Painter insisted on playing by the book, he was called before the governor and summarily fired and federal charges of sexual harassment were doggedly pursued by an administration eager to put him away for good. But he fooled them. He was acquitted, and he filed a civil lawsuit against his accuser, which he won at the trial court level but lost on appeal (See story HERE). He currently has another civil lawsuit pending against the Office of Inspector General (OIG). Now the state is dragging that litigation out in the hopes that with his limited finances and the state’s ability to draw on taxpayer funds indefinitely, he can be waited out until he no longer has the financial resources to seek the justice due him. Briefs, motions, requests of production of documents, interrogatories, continuances—all designed to extend the fight and to keep the lawyers’ meters running and the court costs mounting—are the tactics of a defendant fearful of an adverse ruling. If that were not the case, it would be to the state’s advantage to try the case ASAP. And never mind that every brief, every motion, every interrogatory, every request for production, and every continuance means the state’s defense attorneys are getting richer and richer—all at the expense of taxpayers who are the ones paying the state’s legal bills. But all that aside, LouisianaVoice has come into possession of documents that clearly show the state was in violation of Painter’s constitutional rights and that an investigator for OIG simply colored the truth in the reports of the OIG “investigation” of complaints against him. That investigator, who now works for the East Baton Rouge Parish coroner’s office, was inexplicably dismissed from Painter’s civil lawsuit against the state by the First Circuit Court of Appeal. Painter has taken writs on that decision to the Louisiana Supreme Court as that civil litigation rocks on in its sixth year of existence. I’ll get back to him momentarily. 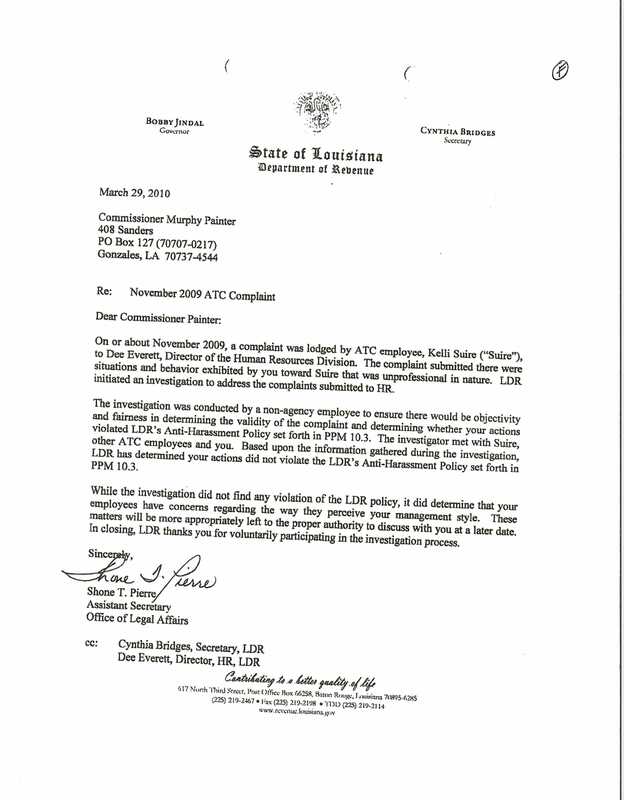 Then on Aug. 13, 2010, more than four months following Bridges’s letter, Baton Rouge television station WBRZ reported that Painter “resigned” and the OIG’s office simultaneously raided ATC offices, seizing Painter’s state desktop and laptop computers, three thumb drives, notes, affidavits, reports, maps, ATC documents, telephone reports, and a 2010 Dodge Charger assigned to Painter. There was only one problem with the timing. Bonnie Jackson, 19th Judicial District Judge, did not sign the search warrant authorizing the raid and search of Painter’s office until Monday, Aug. 16. 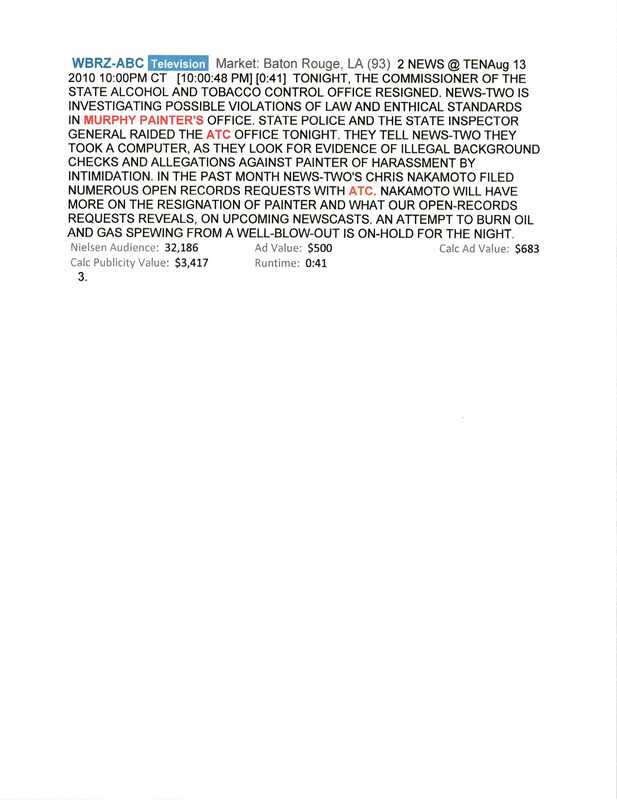 The second violation, the destruction of evidence was not learned until three years later when Painter’s computer was finally returned and he found that some 4,000 files had been deleted. Much of that, of course, would have been routine state business related to ATC operations but there was other information contained in the files, Painter says, that could have helped exonerate him from the charges that were lodged against him by the Jindal administration. It is not only illegal to destroy evidence, but also to destroy state documents—even if they do not constitute evidence. The third violation, this one by OIG, involved the apparent misrepresentation of testimony given in interviews by an attorney and his assistant who had experienced difficulty in obtaining a liquor license on the part of his client, a business with multiple out-of-state owners, a situation which made the licensure procedure more involved. “During the meeting with Mr. Painter, he told Ms. Edwards that he had run her driver’s license and looked at her photograph. He said that was the only reason that he had granted them the meeting. (That is blatantly false: Copies of the Dec. 14, 2008, email exchange between Painter and Brantley obtained by LouisianaVoice clearly show that Painter invited Brantley to a meeting before he ever knew of Edwards’s existence.) She took his statement as the only reason he decided to meet with them is because he thought she was attractive. Ms. Edwards said his statement and demeanor made her very uncomfortable. She said she was very glad Mr. Brantley was present. Another report by OIG, the result of a second interview with Edwards on Nov. 5, 2012, described both Brantley and Edwards as “uncomfortable” during the meeting with Painter. 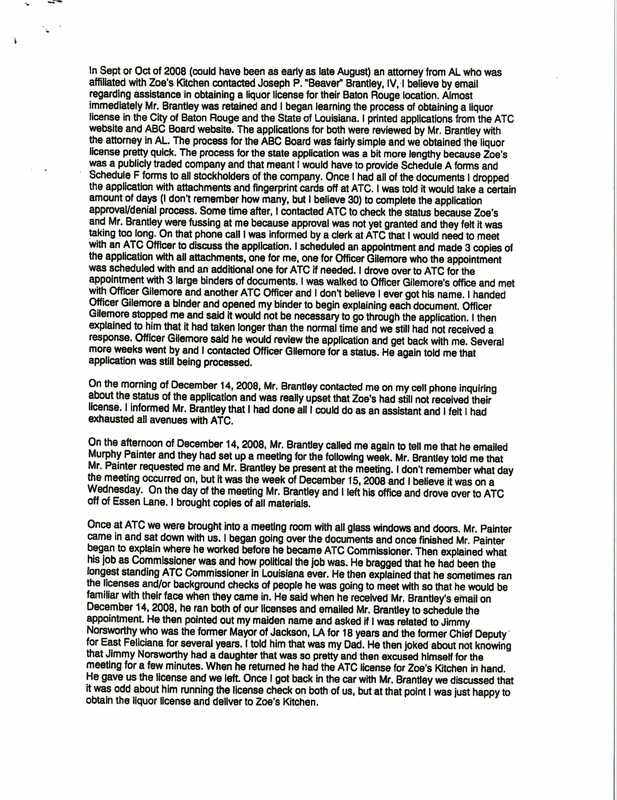 A second interview of Brantley on Nov. 7, 2012 produced yet a fourth OIG report that said, in part, that Edwards wore a “professional,” semi-low-cut shirt. “Mr. Brantley noticed that Mr. Painter noticed and glanced at Ms. Edwards’s chest during the meeting. “…According to Mr. Brantley, Mr. Painter ‘clearly looked at’ Ms. Edwards’s chest,” the report says. Mr. Brantley even told Ms. Edwards that Mr. Painter was attracted to women, maybe more ‘than the average guy.’ Although Ms. Edwards would have attended the meeting anyway, Mr. Brantley took her to the meeting ‘for effect.’ He thinks that the meeting was more successful than it would have been otherwise if Ms. Edwards had not attended. 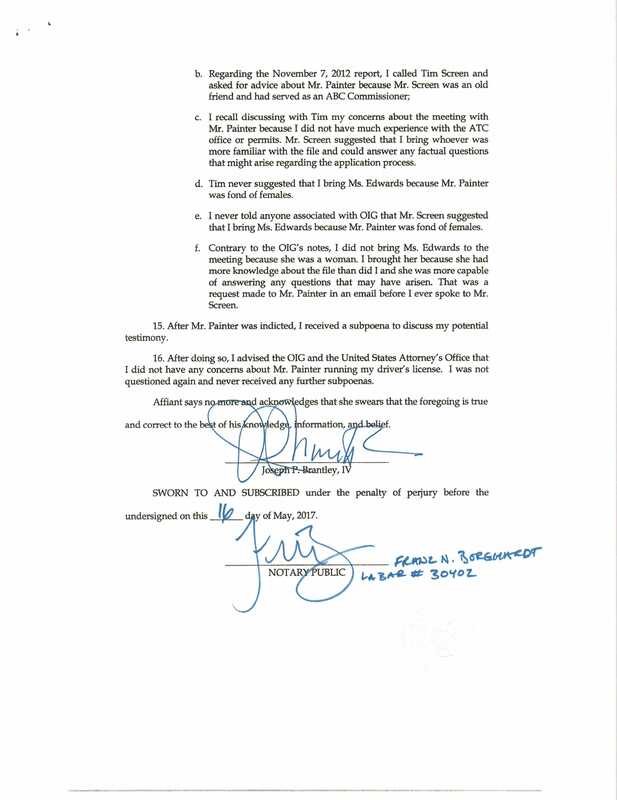 Well, it would be except for affidavits signed and sworn to by Brantley and Edwards (now Pierce), which provide quite a contrasting version of events. Brantley, after reviewing the OIG reports, flatly denied ever telling Evans or any other OIG investigator that Edwards took part in the meeting with Painter because Painter was fond of females. Edwards pointedly noted that the meeting took place in a room “with all glass windows and doors.” She said she also learned at the meeting that Painter was a long-time acquaintance of her father, a former deputy sheriff in East Feliciana Parish and joked to her that he didn’t know her dad “had a daughter that was so pretty.” She said he then excused himself for a few minutes and later returned with a license for Brantley’s client. So, with a little tweaking of the facts, a man’s career was ruined, his occupation stripped from him and his finances gutted—all because he insisted that a major campaign contributor submit the proper forms before obtaining a liquor license for his Sunday parties outside the New Orleans Superdome. This is Louisiana at its worst, folks, and it’s a clear example of how the political establishment can crush you if you don’t have the right contacts and sufficient financial resources to match those of the state’s taxpayers. Troy Hebert just won’t go away. But in this case, he’s probably like to. The former commissioner of the Louisiana Office of Alcohol and Tobacco Control (ATC) is scheduled in U.S. District Court Monday as a federal racial discrimination LAWSUIT against him and ATC cranks up. The lawsuit, to be tried before U.S. District Court Judge John W. DeGravelles, was filed by former ATC agent Charles M. Gilmore of Baton Rouge, Daimin T. McDowell of Bossier Parish, and Larry J. Hingle of Jefferson Parish. The three claim that Hebert made working conditions so bad that employees had to take medical leave or were forced to resign. Each of the three filed separate complaints with the Equal Employment Opportunity Commission and received “right to sue” notices. The lawsuit says five African-American supervisors worked in the ATC Enforcement Division when Hebert, a former state senator from Jeanerette, was appointed by then-Gov. Bobby Jindal in November 2010. “By means of the manipulative actions by Troy Hebert…there are now no African-American supervisors within the ATC Enforcement Division,” the petition says. The suit says Hebert “deliberately acted in disregard of the plaintiffs’ clearly established rights to be free from racial discrimination, race-based harassment and retaliation. Gilmore worked for 10 years as a corrections sergeant and Louisiana State Police trooper before joining ATC in 1998 where he worked his way up to Special Agent in Charge until he was “constructively discharged” by Hebert on Sept. 27, 2013, the lawsuit says. “Constructive discharge” is when working conditions become so intolerable that an employee cannot stay in the position or accepts forced resignation. McDowell was hired by ATC in 2005 and in his seven years was promoted three times. Hingle was hired in 1991. During his 21 years of employment, he was also promoted three times. The lawsuit also alleges that on Aug. 22, 2012, two days after taking leave, Gilmore and McDowell were told by fellow agent Brette Tingle that Hebert intended to break up the “black trio” a reference to Gilmore, McDowell and Supervising Agent Bennie Walters. Walters was subsequently fired on Sept. 7. There are times when, after you break a major story about official wrongdoing and after the requisite denials by those involved, everything gets quiet and the story seems to have hit a dead end. Or at least been placed in a state of suspended animation. But generally, if you are willing to be patient and wait long enough, the story gets new life with the surfacing of new information. Illegally steered applicants for liquor licenses to attorney Chris Young for representation through Young’s sister, Judy Pontin, executive management officer for the New Orleans ATC office. Now, thanks to a wrongful termination lawsuit filed against Hebert by a former ATC agent, those same issues have surfaced again. 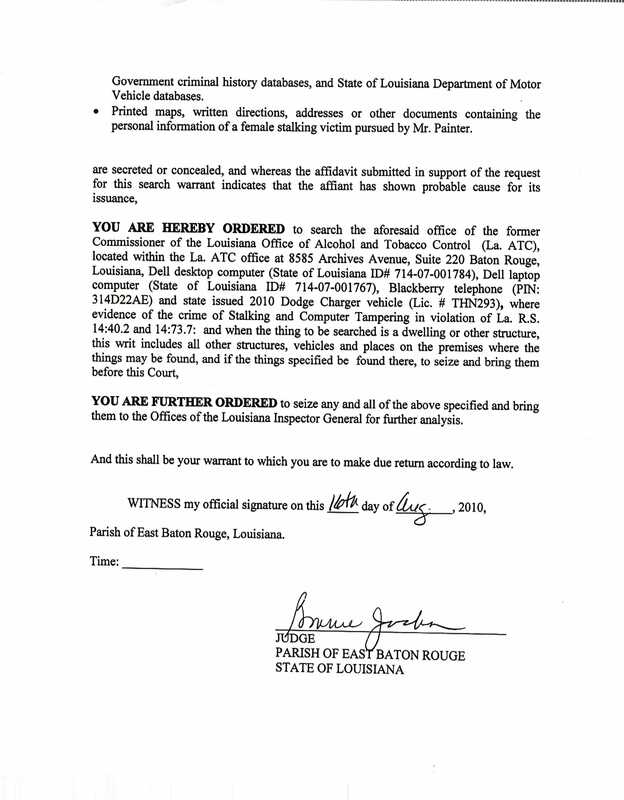 Documents concerning still another issue, the suppressing of an investigation into a Baton Rouge bar following a 2012 accident involving a patron of the bar who had a blood alcohol content of .307 when he struck and killed two cyclists, killing one and injuring the other. LouisianaVoice wrote in a February 2016 POST that Hebert wrongfully took control of the investigation and personally exonerated the Bulldog Bar from any wrongdoing. Chris Young was legal counsel for the Bulldog. The only problem for fired ATC agent Brett Tingle, who filed the lawsuit against Hebert, it’s possible that none of Hebert’s repeatedly invoking the Fifth Amendment in a deposition will be allowed into testimony. Federal Judge John DeGravelles of Louisiana’s Middle District in Baton Rouge, currently has under advisement Hebert’s motion for protective order filed by attorney Renee Culotta which would, if granted, prohibit Tingle’s attorney, J. Arthur Smith, III, from posing any questions at trial about Hebert’s relationship with Palmer and/or Young. Smith” I’m going to show you Exhibit No. 9 (redacted). What is this document, sir? 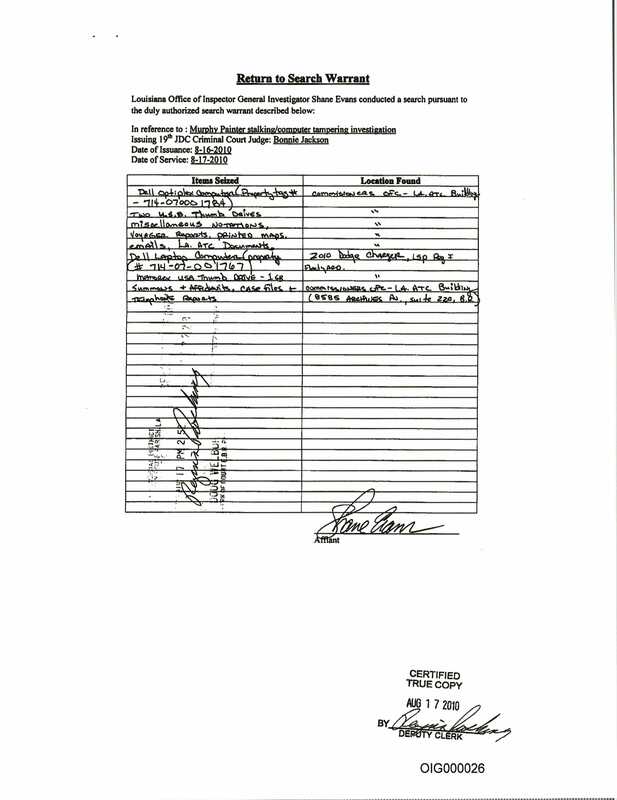 And this memorandum, we should point out, was written by Hebert’s attorney, Renee Culotta, who is being paid thousands of dollars while under contract to the Attorney General’s office as a contract attorney—just as she was in a previous lawsuit against ATC, that of Lisa Pike, a former ATC employee who also sued Hebert. The terms of that settlement have been held confidential by the court. 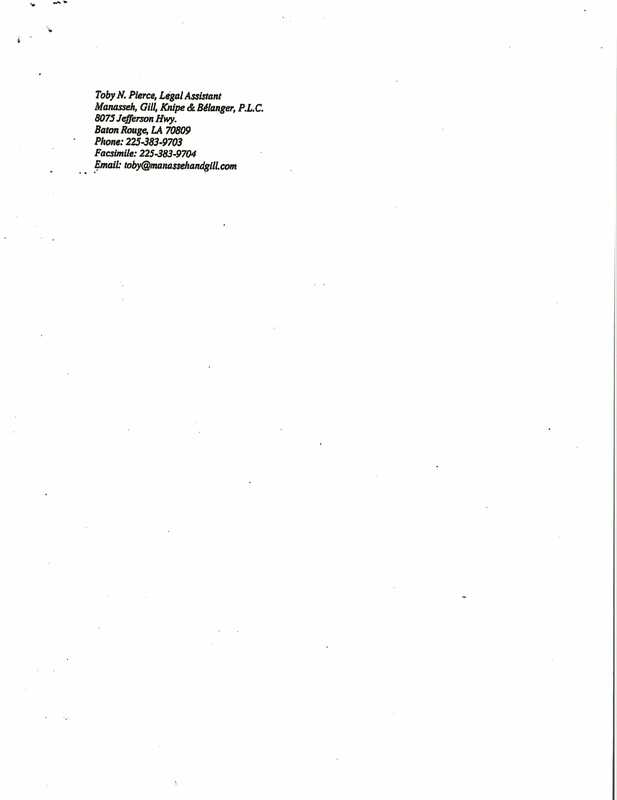 LouisianaVoice has made a public records request for Culotta’s billing for legal representation in the Pike matter. Her billing in the defense of the Tingle lawsuit would not be made available because the case is ongoing. Culotta said in the memorandum that allegations by Palmer against Hebert “occurred in January 2016, well after Tingle’s work for and termination from the ATC. Tingle did not participate in any issue concerning Sarah Palmer and/or Steak and Lobster, and no facts about Palmer or Steak and Lobster are contained in (Tingle’s) complaint. “Likewise, the issues concerning Chris Young (i.e., whether Hebert gave preferential treatment to Young and/or referred clients to Young as part of an illegal scheme) are also not a part of this lawsuit and are not relevant to and have no bearing on whether Hebert allegedly retaliated against Tingle because of Tingle’s participation in the race discrimination charges and lawsuits filed by three African-American employees. Tingle’s counsel’s questions and discovery concerning Chris Young and/or Sarah Parker were only meant to embarrass and harass Hebert,” Culotta said in her memorandum. “Hebert cannot fully defend himself in the civil case (i.e., by explaining his position concerning Young, Palmer and (t)he Star Steak and Lobster license renewal) while the threat of criminal prosecution is looming. “Plaintiff cannot have it both ways: if he intends to pursue this evidence, he then must agree to a stay in order that Hebert can defend himself without threat of criminal prosecution. Now I don’t pretend to be a legal scholar. Journalism schools (or at least the one I attended) sadly do not require any courses in law even though any career journalist is going to be covering courtroom procedure at some point during his career. That said, it appears to me that someone is one helluva lot more concerned with potential criminal exposure than any civil liability. But then, that’s understandable. If a public official is convicted of criminal wrongdoing, he is the one who is penalized. If, on the other hand, a civil verdict is returned against that same individual, it is the taxpayer who ultimately pays whatever judgment is assessed.